To this end, the horses of these regiments are all large beasts, and trained to bring out a nasty temperament: it is not just the rider who fights in some cases! They use their weight to push enemies back, while slashing to kill and maim. 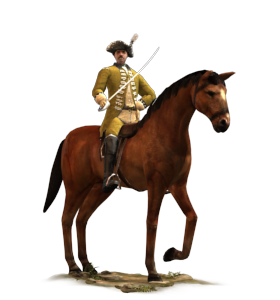 Historically, many regiments of horse were raised under contract by a colonel, and were regarded as his personal property. A colonel could choose his own officers by selling commissions or by appointing his friends and cronies to the posts. He also had a free hand over drill, uniform and horses for “his” regiment, and it was not unknown for unscrupulous men to have a few “ghosts” in the regiment so that their pay could be claimed from the government and kept by the colonel. Given that the regiment was “his” property, it was also not unknown for a colonel to argue with his general if his men were ordered to carry out dangerous, unpleasant or low-status tasks. A colonel had his honour and profits to consider, after all.